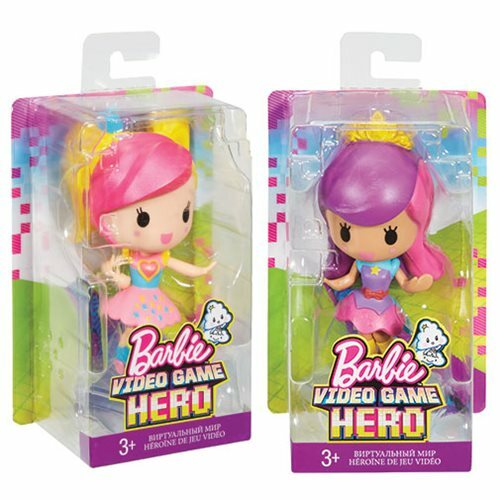 Inspired by Barbie Video Game Hero, these adorable small figures are ready to power up, level up, and change it up! Bright colors, cute outfits, and a 5 1/2-inch scale make these characters step out of the 2D sticker world of the video game and into your 3D reality. There are 6 characters in the assortment, including Barbie, and each junior doll comes with a stand for easy display. Fabulous head adornments like a tiara, headphones, or dramatic colorful swoop add extra personality. Young gamers will love recreating favorite scenes or playing out a new game of their own! Collect them all for a full cast of video gaming characters. Colors and decorations may vary.